1) An Eph Style Guide, with no penalties for violation, is still an excellent idea. What would be the key components of such a guide? First, a clear and ringing affirmation of the central role played by unfettered intellectual inquiry at Williams. Freedom of thought and conscious must be protected and nurtured at all costs. Those who come to Williams from sheltered backgrounds may be unused to confronting radically different points of view, to having their ideas and beliefs challenged. They need to be reminded that intellectual honesty, saying what you believe and defending what you say, is the highest value at Williams, bar none. Freedom of speech does not stop at the top of Spring Street. Second, such a guide could provide an overview of words and symbols that are simply beyond the pale. By all accounts, the KKK cookout controversy of last spring was an honest mistake. The author of the flyer did not realize that those three letters remain a potent symbol of hatred and injustice. An Eph Style Guide could make that clear. The existence of a guide, required reading for all members of the community, would remove ignorance as a defense. Note that nothing in such a guide restricts speech in any way. It is a guide, not a code. If you want to advertise your flyer using the initials KKK, you are still free to do so. But your speech will be met with more speech. You will be called insensitive, because you are. You will be challenged, because you deserve to be. Yet honest mistakes will be made less likely. Of course, an Eph Style Guide of limited length will need to make choices about what to include and what to exclude. KKK would be included, but “cakewalk,” a term with a viciously racist past, would probably not make the cut. Just the process of thinking harder, slowly and carefully, about what is offensive and why, is a valuable exercise for the College. I would expect the committee responsible for the guide to publish a series of drafts, hold (poorly attended) public meetings and actively seek comments from the broader community. Third, a guide would make clear what is allowed, what difficult and controversial topics will be, indeed must be, discussed at Williams. For example, common culture affects individual decisions. American culture in the mid-19th century affected the decisions made by Abraham Lincoln just as Japanese culture of the 1920s and ’30s influenced Hirohito’s. To mau-mau Barnard over his claim that Hispanic culture influenced the behavior of specific contemporary baseball players, as some members of VISTA did last spring, is to misunderstand the sorts of conversations that must be allowed, even encouraged, at Williams. Alas, I doubt that this is what CC is considering. (By the way, who are the key students pushing this idea?) Whoever they are, they almost certainly want the College to punish speech/behavior that they find offensive. 2) Before going to far down this path, College Council should try to learn from its own history. Read this for discussions of similar efforts in 2004 and 2008. 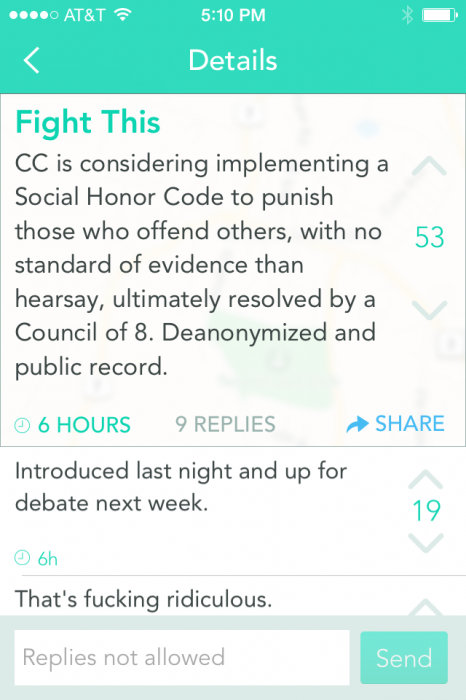 Do any readers think that a social honor code is a good idea? Is there a better way to reinforce Williams’ reputation as a poopy pants institution than for its students to be homogeneous stylistically? Leave it to Yik Yak to create a sensationalist news story where one does not exist. As a member of council and someone who attended the meeting, I can assure you of several things that can be confirmed once the minutes from the meeting are released next wednesday night. First, such a proposal to amend the honor code is being considered, however the idea of a social honor code such as the one described above had little appeal to members of council, myself included. My favorite comment used to describe the idea was “Orwellian”. I assure you that many members of council are vehemently opposed to the idea. I think the person who proposed the idea was merely bringing up several suggestions largely taken from Haverford College’s honor code. As a Haverford native, and someone who follows the school quite closely I have absolutely no desire to see our honor code completely mimic theres. However there may be some things we can learn from Haverford’s code. The idea of mediation comes to mind. If for example person A has a problem with person B it is person A’s responsibly to confront person B about the offense. I personally think such an initiate would be beneficial for communal learning and growth. However I do not think that a social honor code with a “council of eight” should have punitive powers and I would, along with many members of council, fight such an initiative. College Council Meetings are always open to the public and I invite anyone who wishes to voice their concerns or simply listen in to join us this coming Wednesday from 7:30-9:30. EphBlog is powered by WordPress and delivered to you in 1.109 seconds using 40 queries..